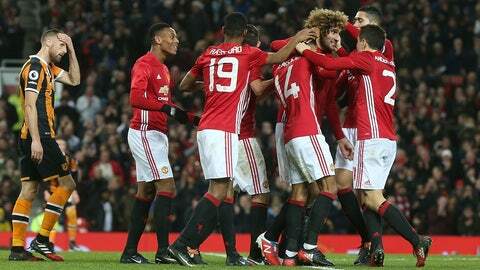 Manchester United put one foot in the final of the League Cup after beating Hull City 2-0 at Old Trafford in the first leg of their semifinal matchup on Tuesday. Juan Mata and Marouane Fellaini scored in the second half for the Red Devils, who have won nine straight matches in all competitions and haven't lost in 15. The last loss came in the UEFA Europa League against Fenerbahce on Nov. 3. Both goals came from close range. Mata opened the scoring in the 56th minute, remaining onside before poking home a cross-goal header from Henrikh Mkhitaryan. Fellaini provided a crucial second goal in the 87th minute with a looping header following a cross from the left by Matteo Darmian. The second leg will be played January 26 at Hull City. The winner will play the winner of the Southampton-Liverpool semifinal for the trophy. United and Liverpool renew their rivalry in Premier League play on Sunday as the league resumes following a 10-day break after the hectic winter slate.